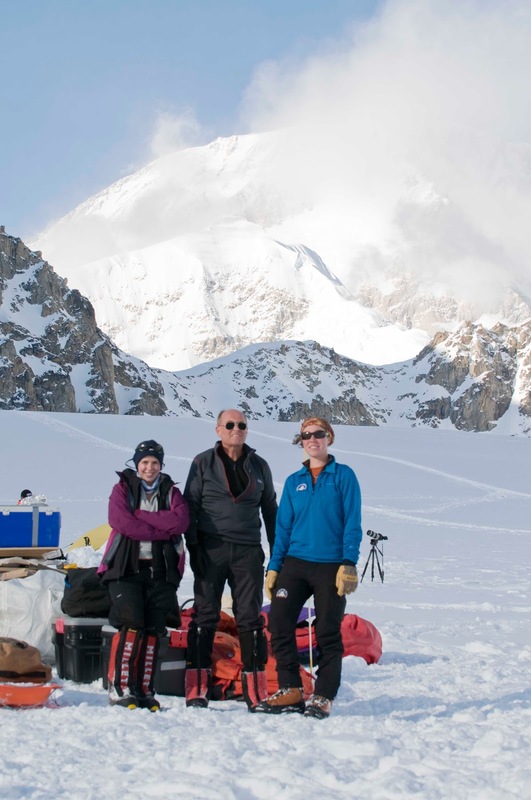 AAI climbers Maria Conceicao and Chris Heywood recently flew into Denali Basecamp on the Kahiltna glacier. They are accompanied by AAI guide Aili Farquhar, who will be training Maria and Chris before they begin their Denali expedition. Maria, Chris, and Aili at Basecamp. Currently Basecamp appears rather quiet, however it will soon be flourishing with climbers attempting to reach Denali's summit. On April 29th, they rest of their team will meet them on the glacier, along with their guides Alasdair Turner and Chad Cochran. Alasdair couldn't help but hitch an early ride into the Alaska Range to take a few photos, and snapped the following pictures. The team, alongside one of K2 Aviation's de Havilland Turbine Otter. 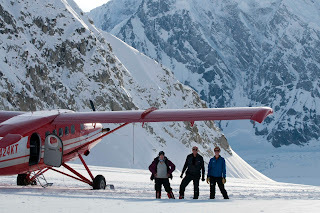 This 10 seater bush plane flies aspiring climbers and their gear into the AK range. Alasdair snapped this excellent photo and his way out of the Alaska Range. 5/1 -- Burlington, VT -- Mark Synnott, Life on the Vertical: Buy Tickets. 5/3 -- Charleston, SC -- Mark Synnott, Life on the Vertical: Buy Tickets. 5/7 -- West Chester, VA -- Dean Kamazes, Life in Motion: Buy Tickets. 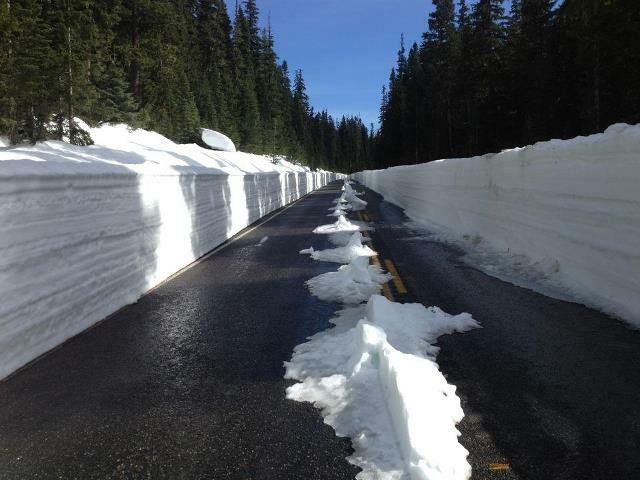 5/12/ - 5/13 -- Mazama, WA -- Highway 20 Ski Party. 5/12 - 5/13 -- New York, NY -- Peak Experience VII, Climb Everest without Leaving Manhattan: Learn More. 5/16 -- Anchorage, AK -- Kit DesLauriers, Journey through the Arctic Refuge: Buy Tickets. 5/24 -- Houston, TX -- Mark Synnott, Life on the Vertical: Buy Tickets. Check out this ski run by Drew Tabke that earned him first place at the Swatch Freeride World Tour 2012 at Fieberbrunn in Tyrol, Austria. This next clip is a beautiful glimpse at a new feature-length film about skier Candide Thovex, who after winning multiple X Games gold medals in 2000, 2003 and 2007, he broke his back, then returned to competition to win the 2010 Freeride World Tour. April Ski Mountaineering Course - A Complete Success! Last week, AAI guides Erin Smart, Andrew Yasso and Lee Lazzara ran a ski mountaineering course. The students and guides explored the Mount Baker backcountry just outside the ski area, skiing the infamous Stone Man Couloir, and then journeyed up onto Mount Baker proper to ski some steep glaciers. The course was an absolute success. The Twin Sisters, Jeff Reis. 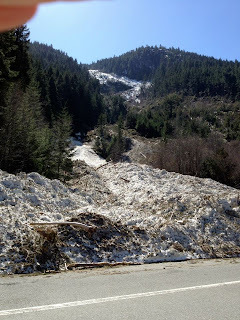 Highway 20: Snow Clearance update map. Hwy 20 Closed, Ryan Rickerts. 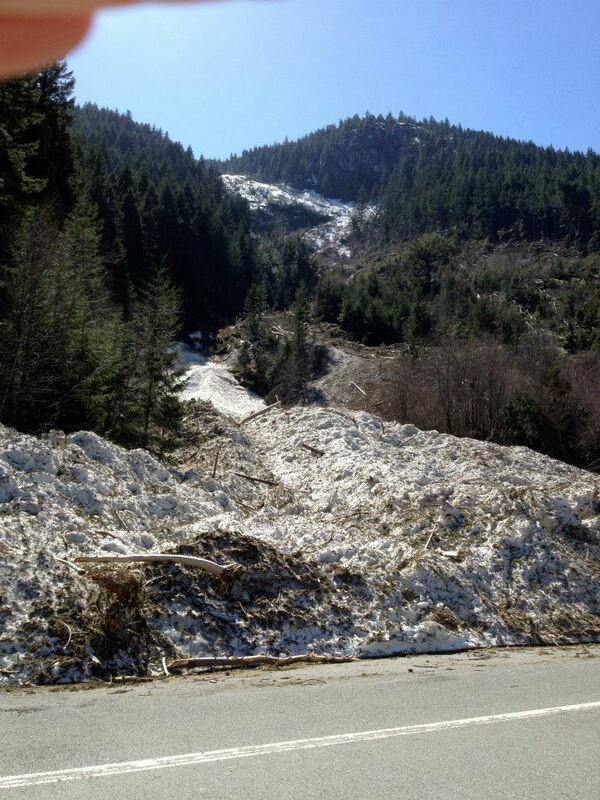 Nice sized slide on Hwy 20, Ryan Rickerts. 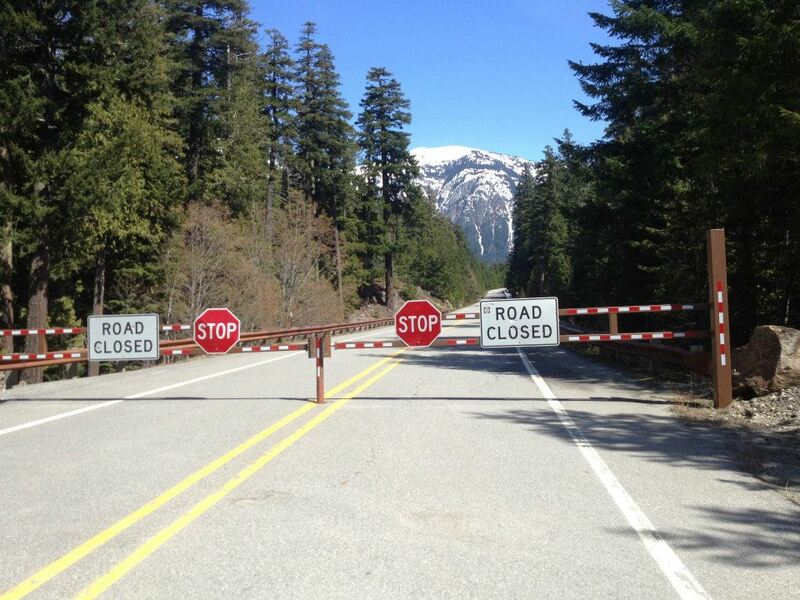 Leavenworth: Midnight and Noontime Rocks closed April 1 - July 31 for raptor nesting. 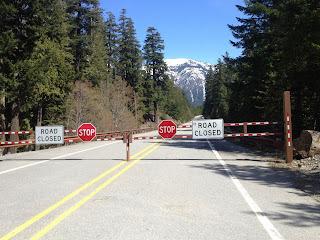 Gold Bar Climbing Access: As of Winter 2012 the Washington Climbers Coalition (WCC) has secured access to the gate on the road which leads up to the Gold Bar boulders and the approach to Zeke’s Wall. 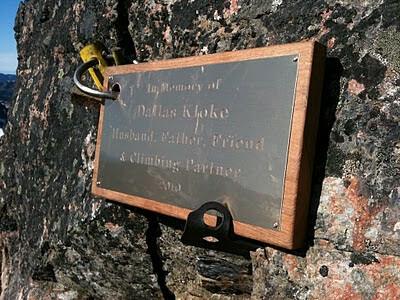 Climbers who are members of the WCC are welcome to climb at the Gold Bar Boulders and to park there for access to Zeke’s Wall, as guests of the Manke Timber Company. Please note: all climbers using this road must be members of the WCC and have a WCC sticker as well as a valid Discover Pass. Denali National Park: the road is now open to the Teklanika River Rest Area at Mile 30. Over Earth Day Weekend Anacortes Community Forest Lands, the Mount Erie Climbing Committee and Solid Rock Climbers for Christ came together to do a Mount Erie clean-up and trail-building project. Sixty volunteers showed up for projects throughout the Forest Lands and the group did a wide variety of projects. I had the opportunity to do something completely different from the projects I've done in the past at these kinds of events. For once I didn't build a trail or pick up trash. No, this time I had the opportunity to help fight a scotch broom infestation on the mountain. In 1965 Lady Bird Johnson's Highway Beautification Act was responsible for the intentional planting of scotch broom along the I-5 corridor. The plant quickly became an invasive species and began to spread all over the Pacific Northwest. Some of the volunteers on Mount Erie have been fighting the weed for a number of years. We visited a site where they had previously pulled all the scotch broom plants they could find. As they grow quickly, there were quite a number of new plants there. Once the clean-up was finished, my wife and children arrived at the mountain. We spent the rest of the day rock climbing. Dallas was a high school track coach and a mentor to many young climbers. A day like the one we had, cleaning up Mount Erie and then climbing with kids, is perhaps one of the best ways to remember the man. Probably what draws me most to climbing is adventure. Sometimes the uncertainty of the day is an integral part of success - whether you top out or not. I love getting out in the mountains with good friends, doing long, aesthetic routes. Whether on snow, rock, ice, or all of the above, a beautiful line is what draws me to the mountains time and time again. Perhaps the most adventurous climbs are those that have never been done. There is such limited information - there's no topo, no Mountainproject beta on your iPhone, no certainty of success. On the first ascents I have done, the biggest piece of information was simply a picture we took before climbing the route. One of my favorite new routes that I have done is Diggin' for Dreams, a line that I climbed with two of my best friends this past summer. We were climbing on the South Early Winter Spire up in Washington Pass the previous day, and spotted a nice-looking cliff across the valley. I had looked at the face probably a dozen times but never went up to try and climb it. The next day, Alan Rousseau (who guides for AAI in Alaska) and Rob Schiesser (a guide and the guy who taught me how to climb back in college) we were at the base after a mild two-hour approach. We brought the kitchen sink - aid gear, pins, tons of cams, but in the end only used two pitons and a standard rack, freeing freed the whole route onsight, ground-up, with no bolts. Though I do think that adding a few bolts would make the route a little friendlier, I like the idea of a completely traditional route. Diggin' for Dreams is on the NW face of Choi Oi Tower, a subpeak of Half Moon. The Half Moon, Choi Oy, and Hai Tower massif forms a giant open book, easily visible from the nearby Liberty Bell Group. 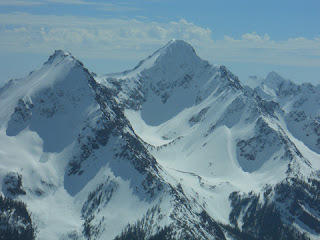 In the picture below, the peaks of Halfmoon (L), Hai Tower (Middle), and Choi Oi Tower (R) are shown with the established lines that Beckey (1965, Left) and Kearney (1986, Middle) established on the face. Diggin' diverges from the giant dihedral after two pitches. After one more pitch in the corner, the crack seams up and roofs out, prohibiting passage without a lot of cleaning and bolting. At this high point in the dihedral, we spotted an old piece of webbing, likely from an exploratory attempt. It was bleached white from age. After emailing a number of Washington climbers, we have heard no information about this previous ascent. So, we are claiming a "likely first ascent." The climbing on Diggin' was incredible. The line covers nearly 1000' feet in 9 pitches. With the exception of two runout pitches at the top, the entire route was well-protected and sustained at 5.10 and above, climbing clean cracks from base to summit. Wow! What a pleasure it was to climb this route. There was one 10-foot section of crumbly rock (the only poor rock on the route) on pitch 4. While I led it, I threw down yet another fistfull of granite down, trying to get to good rock underneath, to which Rob yelled up, "You dig for that dream!" P2: 70’ 5.10+ jam/lieback right-facing corner to face climbing on right. P3: 160’ 5.10+ Slab to undercling and strenuous fist crack behind flake. P5: 70’ 5.11 Thin seam in an open book leads to finger crack in right-facing cornerending with a difficult mantel. P6: 70’ 5.10 Zig-Zagging hand to fist crack leads to a left-facing corner. P7: 150’ 5.10- Begin up left-facing corner for 15’ then traverse right 100+ feet on the face. P8: 140’ 5.8 X Lichen slab. Pucker up! P9: 110’ 5.10 the pitch begins with 20’ of thin 5.10 face moves without protection. The rest of the pitch is mid-fifth blocky terrain leading to the climbers left bat ear summit of Hai tower. 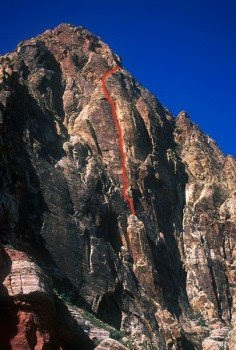 Descend off the back side via two single-rope rappels and walk North to reach the col visible on the climber's left side of the route photo. Rack: doubles through #2 Camalot, single #3, #4. Finger-sized offset cams useful. 1 KB and one angle pitons. Now, as I warm up to climb in Alaska this summer with Alan, I remember the success that we had on many levels on Diggin' for Dreams. It was a clean line, a beautiful climb, done with two great friends in the heart of the summer. You've got to hold them in your heart." -Van Morrison. "These are the Days"
4/21 - 4/28 -- Joshua Tree, CA -- National Park Week: Free Entry to JTree National Park. 4/24 -- Salt Lake City, UT -- Dianne Van Deren, Back from the Edge : Buy Tickets. 4/26 -- New Haven, CT -- Mark Synnott, Life on the Vertical: Buy Tickets. 4/27 -- Vienna, AUT -- IFSC Climbing WC Live on the internet: Bouldering. Here's a clip of some great Southwest climbing near Albuquerque with Cody Roth. There are lots of famous mountains in the world. We regularly hear about peaks like Everest, K2, and Annapurna. But in some ways important peaks of the past have become almost passe. It's easy to forget that there was a time when The Matterhorn and Chimborazo were two of the most important unclimbed mountains in on the planet. Many consider the era of 1854 to 865 to be the Golden Age of Mountaineering. It was during this time that Edward Whymper, the undisputed king of early climbing, made first ascents of dozens upon dozens of mountains, including the iconic rocky crags of the Matterhorn and the ice encrusted double-summit of Ecuador's Chimborazo. 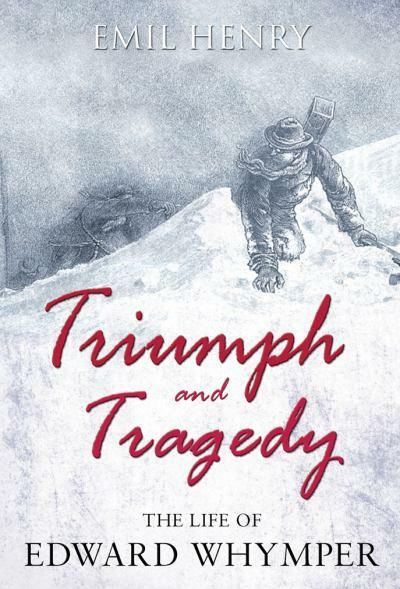 Triumph and Tragedy: The Life of Edward Whymper by Emil Henry is an engaging historical read that brings one back to the beginning of alpinism. In some ways, the book is standard biographical fare, it chronicles Whymper's life while exploring his motivations. But there is something more to the narrative than this. When the story takes us into the mountains, the biographical elements begin to fall away and we feel like we are on the flanks of major peaks in the Alps or in the Andes. Along with the story of a Victorian climber stuck in a stuffy society of ladies in corsettes and gentlemen in stiff suits, there is another story, a story of one who is seeking out true adventure on the highest mountains accessible to man at the time... It is an amazing tale and an amazing exploration of an extraordinary man. Edward Whymper is perhaps most famous for completing the first ascent of the Matterhorn. The climber made numerous attempts on the mountain from a number of different sides before finally reaching the summit on July 14th, 1865. Whymper reached the top of the mountain with Lord Francis Douglas, Charles Hudson, Douglas Hadow, Michael Croz, and the father and son guide team of Old Peter Taugwalder and his son Young Peter Taugwalder. It was during the descent of the mountain that tragedy struck. Hadow slipped and pulled Douglas, Hudson and Croz down the north face of the mountain. Whymper and the two Taugwalder's survived the descent, but were accused of cutting the rope during the fall to save themselves. Subsequent inquiries found no evidence of this. The tragedy on the Matterhorn affected Whymper for the rest of his life. Indeed, the incident was so famous at the time that it became a part of the mythos of mountain climbing. It's hard to understand how deeply this impacted popular culture; the only comparable thing today might be the 1996 Everest Tragedy and the numous books that were written afterward. The incident was so infamous that Whymper could never really escape it. In the 145 years since the first ascent to the time of the book's writing in 2010, "431 climbers have died on the mountain, 58 of them in the 21st century. An interesting subset of these numbers is that no guides -- and only one amateur accompanied by a guide -- have died on the mountain." This continuing death toll on the Matterhorn since the end of the Golden Age -- despite the many advances in climbing equipment, weather forcasting and communications technology -- is a foreful reminder of the skill and courage of the mountaineers who first conquered the Alps all on their own. After the Matterhorn incident, Whymper retired from climbing for the sake of climbing, and instead became focused on climbing for science. His scientific inquires culminated in a trip to Ecuador where he studied high altitude physiolgy by climbing Chimborazo. At 20,564 feet, Chimborazo resides on the equatorial bulge giving it a height greater than Mount Everest when measured from the center of the Earth. It's strange today to read about the Victorian climbers and their attempts to understand how altitude affects the human body. They knew so little about so many things, it's interesting to see them trying to come to terms with how their bodies were reacting to altitude and also to imagine them completely confounded by the idiosyncracies of acclimitization. Triumph and Tragedy is an exceptional read. The book is intriguing for multiple reasons. 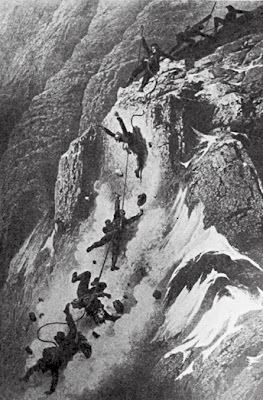 First, it's fascinating to read about how major alpine ascents were completed in the Golden Age of Mountaineering. Second, it's fun to imagine how hard these peaks -- which are totally climbable by an intermediate climber today -- stood out as being the hardest sent at the time. And third, it's incredibly engaging to see the achacic way that these men climbed and to be impressed by their fortitude with absoultely terrible equipment. The armchair mountaineer and the active mountaineer alike will find something engaging and inspiring in the life of Edward Whymper and in his intelleligent biography by Emil Henry. The Cascades, our home range in Washington, have incredible first ascent potential. During the last few years, I've had the fortune to be able to sneak a few new lines in in between guiding with AAI. 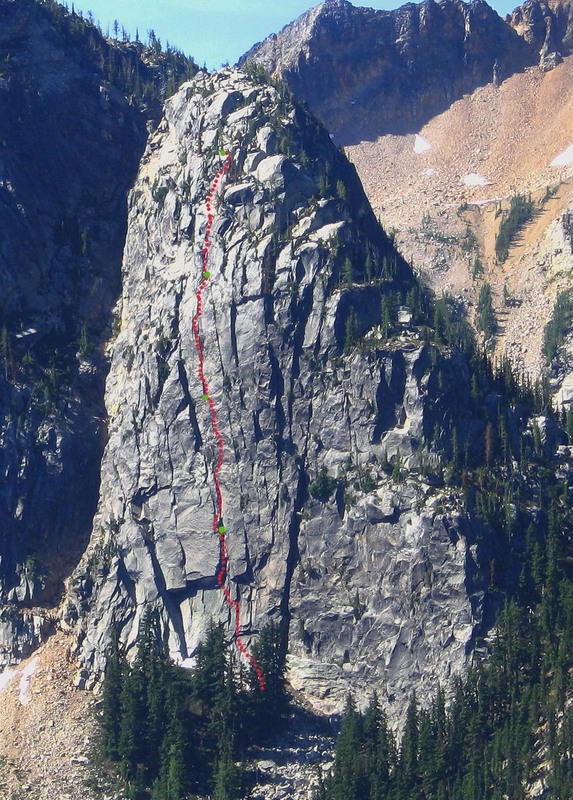 One of them was the "Wright-Pond Route" on the Cutthroat Creek Crag, at Washington Pass. My friend Chris Wright guides a lot, too, which made it pretty hard to make plans. 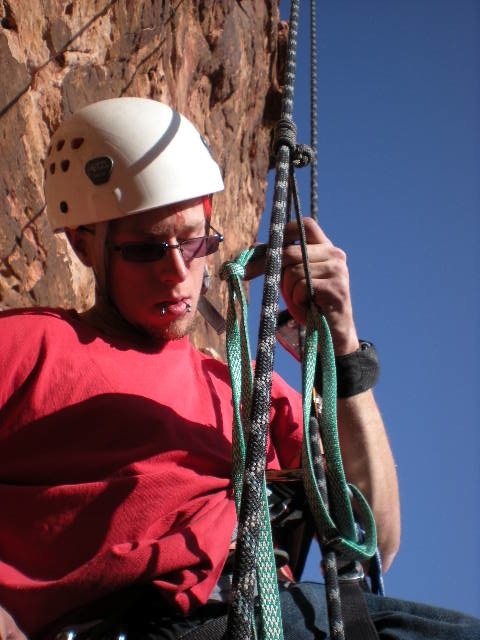 In the summer of 2009, Chris was training for an AMGA course and I had a few day off. I showed up in Mazama and we packed the bags for a new route, on a virgin cliff that we later named the Cutthroat Creek Crag. The cliff itself is the first chunk of rock that you pass on the way to Washington Pass from Mazama. It's a clean piece of granite with with high-quality granite cracks all around. Its low elevation, however, meant that there was ample vegetation in the cracks, which took a lot of work to clean out. We did the first ascent of the Wright-Pond Route in 2009. We bolted only anchors on the first ascent, but returned the following day to clean the cracks, put a few protection bolts to help some runouts, and add a bolted variation to pitch 2. We were going to give it a go that second day, but it started raining. I had to guide the next day, so we returned a short year later and climbed the Wright-Pond Route. We did the ascent "ground up," which means that we did not rappel the route first to inspect or equip the climb. We started from the bottom and went to the top. We brought Chris's power drill to bolt anchors on the way up. The next day, we rap-bolted and cleaned the pitch 2 variation and add protection bolts to pitches one and three. The author leading the first pitch of the climb. This pitch is a beauty! Chris, drilling the pitch 1 anchor. All in all, this climb was a true pleasure. Each of the first three pitches is challenging, technical, and has high-quality climbing on clean granite. (Well, it's clean now). We hope that more people go and check out this crag, as its lower elevation often has better weather than the Spires or Silverstar, and has a mellow one-hour approach. There are numerous other cracks and faces that can be established without too much engineering or gardening. The Cutthroat Creek Crag, from the approach. This angle definitely shows the off-vertical angle of the cliff. 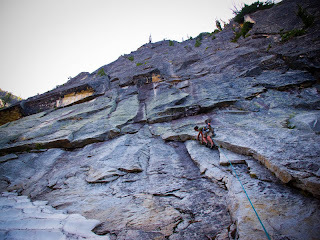 P1: 5.11 a/b, 55m. Begin climbing the obvious, left-facing arch. It seams up right before the crux. Clip the bolt, and move left to a handsome right-facing corner and up to the anchor. A bold, but not dangerous lead. 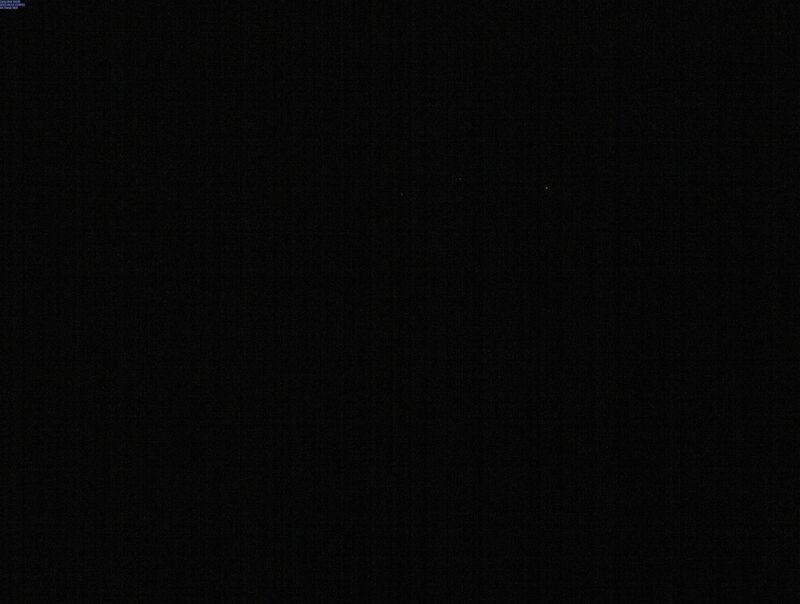 P2: 5.10 b/c, 50m. Head up bolts up clean granite up techy and fun climbing. Exit toward a clean, shallow, right-facing corner and anchor. P3: 5.10a, 50m. Head up obvious right-facing corner until it closes out. Go past small roof and into a left-facing corner with a nice crack. Belay at tree ledge. P4: 5.8, 45m. Climb blocky corner/chimney past tree. Go up a slab to a left-facing corner with a hidden hand/fist crack that leads to slabs. A tree with rappel slings is on the left. Descent: Rappel the route with two 60m ropes. There are bolted anchors equipped for rappels. Rack: Doubles to #3 Camalot, emphasis on small cams and wires. RPs useful. Chris leading the original pitch 2. The new version goes further to the right. If you want any more beta or pictures, feel free to drop a line. I would love to see someone else climb this route or another on the cliff! We just returned from the 9th annual Red Rock Rendezvous and this was a party to beat all parties. I have been involved with the Rendezvous since the second annual event in 2003 and there is no doubt in my mind that the festival is growing up. 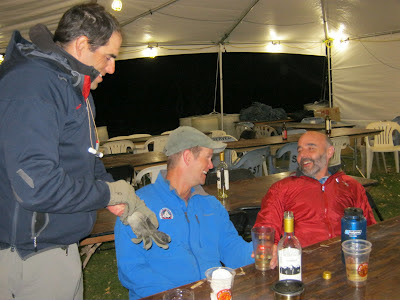 Mountain Gear has been sponsoring the event since the start and they have once again done an absolutely excellent job running a quality event...! This year we had approximately fifty athletes -- well known climbers from the magazines -- as well as twenty American Alpine Institute guides. Attendees had the opportunity to participate in climbing clinics, mountain bike tours, climbing competitions, avalanche awareness clinics, first aid courses, mountain photography classes, service projects and a whole lot more. Pro-Climber and Base Jumper Steph Davis skydived into the event. As always, there was a dyno competition at Spring Mountain Ranch. A beautiful morning at Spring Mountain Ranch. A Climber ascends a rope at Moderate Mecca. There is a history of wind at Red Rock Rendezvous. Indeed, Red Rock is a very windy place with a major wind event (winds above 40 mph) at least once every ten days. This year things were pretty mild. We had a minor wind storm on Saturday night that lasted from about midnight to 10am. In other words, it didn't really have an impact on the event. New Belgium Brewery brought a couple of giant Connect Four games. David Farkas, hanging out in the evening. 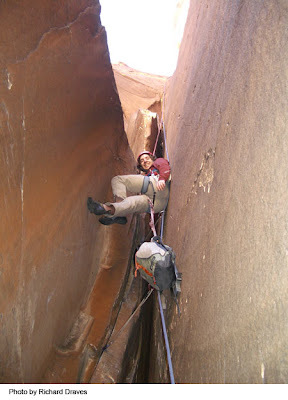 A Climber Learning Leadership Skills at Moderate Mecca. Omega Pacific's Jon Jonckers, AAI's Tim Page and I participated in a VIP designer beer tasting event put on by New Belgium Brewery. Every time I go to this event I'm amazed by New Belgium Brewery and their commitment to outdoor recreation. The two women who put on the beer tasting event told me that they do fifty events a year, nearly all of them at outdoor events. It should be noted that Red Rock Rendezvous isn't all fun and games. One focal point of the event was a service project sponsored by the Las Vegas Climbers Liaison Council. The project expanded the Pine Creek Parking area to add ten new parking spaces, a major accomplishment. 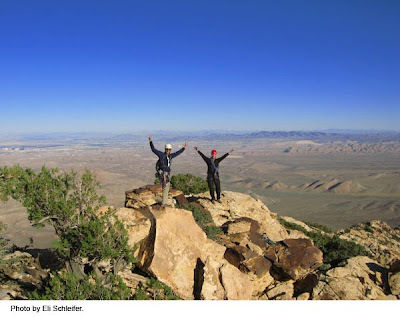 Additionally, the event included raffles and auctions which raised money for the American Safe Climbing Association, the Access Fund, the American Alpine Club, and of course, the Las Vegas Climbers Liaison Council. 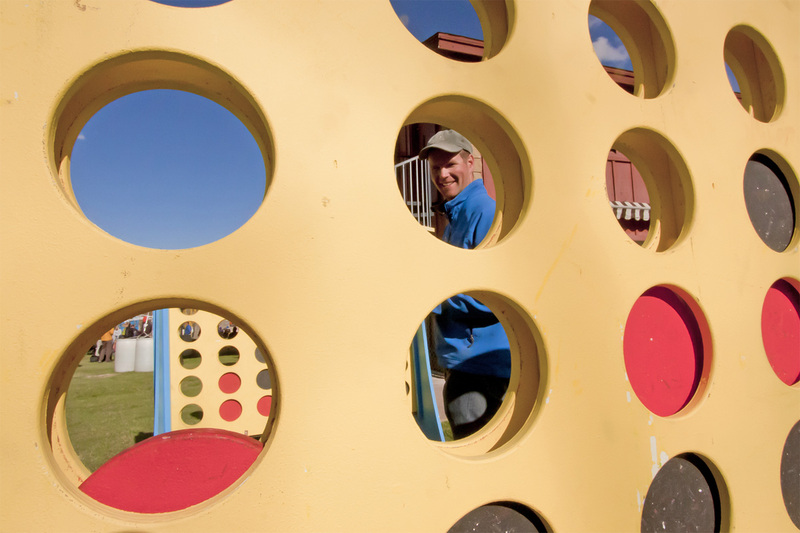 Mark your calendar, because the Red Rock Rendezvous ten year anniversary will take place April 5-7, 2013...and the rumor is that it is going to be bigger than ever! I personally wouldn't miss it for the world! 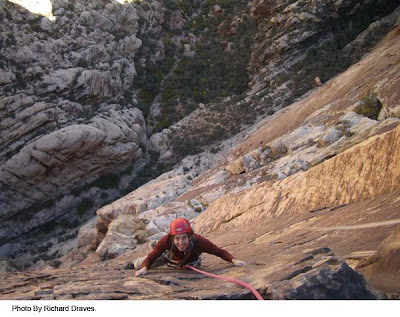 Many climbers consider Red Rock Canyon's Epinephrine (5.9 IV+) to be one of the best routes of its grade in the world. With over fifteen pitches of climbing, Epinephrine is a phenomenal route that places one in an incredible position high above the Black Velvet Canyon. The chimneys on Epinephrine are behind the pillar at the bottom of the wall. Many look at the moderate 5.9 grade and believe that this route will be a walk in the park. The reality is that Epi -- as the locals call it -- is a route that includes significant difficulties that one doesn't often encounter on a regular day out at the crags. Indeed, the route is known for one major feature: a long 5.9 chimney system. The first third of Epinephrine is dominated by chimneys. These chimneys are incredibly smooth inside. Some have even equated them to glass. It often feels that the inch at a time gains inside the chimneys might be lost at any moment from a mild slip or fall. Difficult passage inside the chimneys are exacerbated by the fact that the route is so big that a pack is absolutely necessary. To move through the chimneys one must drag their pack between their legs. A climber in a chimney on Epinephrine. Once the first third of the route is completed, the difficulties ease, but there is still over a thousand feet to climb. The second third of the route ascends an exposed headwall which drops off nearly a thousand feet. There is a great deal of 5.9 terrain in this section of the climb, but the climbing feels significantly easier than that of the chimneys. The 5.9 climbing in the central part of the route is "normal" 5.9. In other words, it feels like any 5.9 that one might find on one of the shorter routes in Red Rock. This section goes significantly faster than the first section. The last third of the route climbs a massive mid-fifth class ramp. One climbs pitch after pitch after pitch of easy terrain that slowly allows altitude to be attained. Finally after traversing an exposed tree ledge, one finds himself at the base of an easy scramble which leads to the top of Velvet Peak. Red Rock Canyon is famous for its moderate (5.6-5.9) multi-pitch routes. There are literally hundreds of them. At the upper end of moderate climbing, Epinephrine stands out as a spectacular and unforgettable adventure. This first video is a behind the scenes look at a route featured in last year's Petzl Roc Trip to China. These next two clips are from the Bridger Point and Chute video competition and are winners of the "Best POV" from Spencer Jonas. Here's Part 2 if you are yearning for more! This last clip, while it is full of some beautiful lines from Xavier de La Rue and Johan Jonsson, it also offers interesting behind-the-scenes insight on how the day is put together on a heli day photo shoot. Go buy some TheraPutty! All orthopedic doctors and physical therapists will recommend putty as a tool for successful recovery. (2) The fingers generally receive poor blood flow so getting blood to the injured area is important. Contrast baths have had mixed results in the literature, but it wouldn't hurt to try. To do a contrast bath, get a bowl of warm water, and cold water. Put injured finger in cold water for a few minutes, then place it immediately in the warm water for a few minutes. Repeat 3-5 times. Finish with the cold water. This could be done after squeezing the putty ball to "flush out" the injured joint. Massaging the effected area can be effective as well. Start out lightly and gradually increase the pressure.